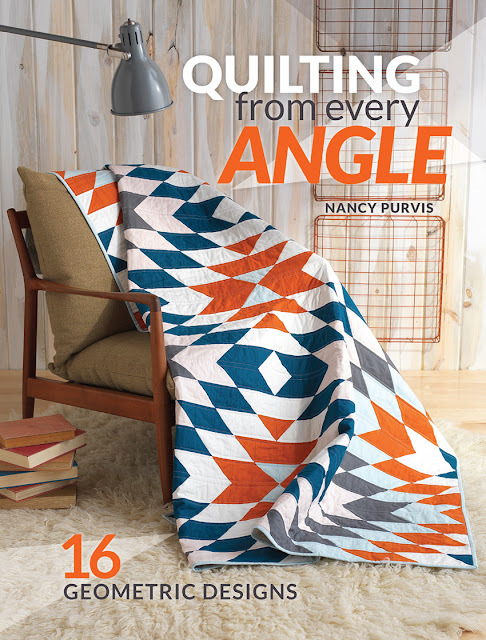 From the moment I got my hands on Nancy Purvis' Quilting from Every Angle, I was mesmerized! Her book is filled with 16 unique quilt patterns in easy to advance skill levels, making it a perfect companion for growing quilters. This book inspired me tremendously, I already have a list of quilts that I want to make from it. Nancy did a great job providing tips and ideas for designing quilts. My favorite tip is her Color Tips and Tricks, where she explained the importance of color and fabric choosing when designing a quilt, making a note on fashion trends and what colors people are wearing? Now that's a great and unique way to gather inspiration for a quilt design. And can I please say, what an honor is to have my inspirational pin board featured in your book? 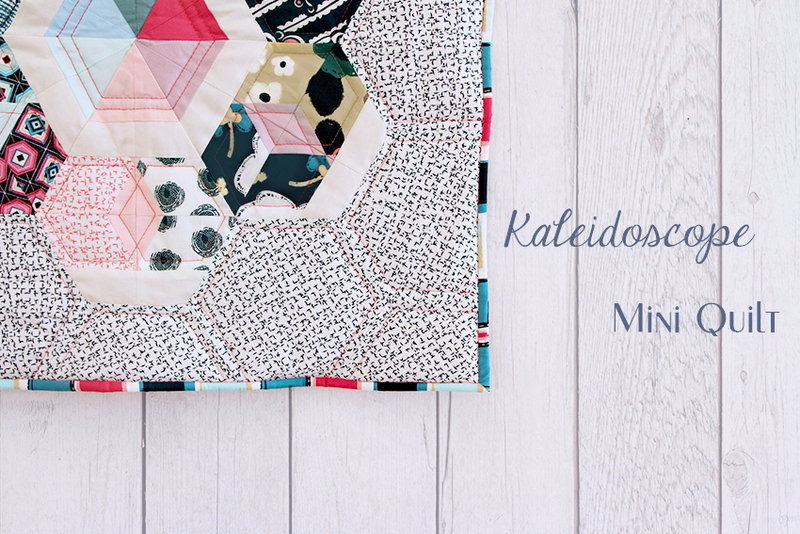 It was so hard choosing a quilt for this blog tour - I love all of them- but I managed to contain my self and picked the Kaleidoscope Mini Quilt..which is adorable! Nancy cleverly colored this quilt using the basic colors of the color wheel, so I decided to make a colorful impression as well with my latest collection, Dare. Isn't gorgeous? I loved making it, and her "My Method: Paper Piecing" is the best, super easy and helpful for this mini quilt. This book has so many adorable quilts and make sure to follow Nancy's blog for the book's updates. The blog tour is not over yet so make sure to check the upcoming posts on the schedule below. Do you want to get your hands on the PDF version of this amazing book? I bet you do, so answer these three questions in the comment section below! 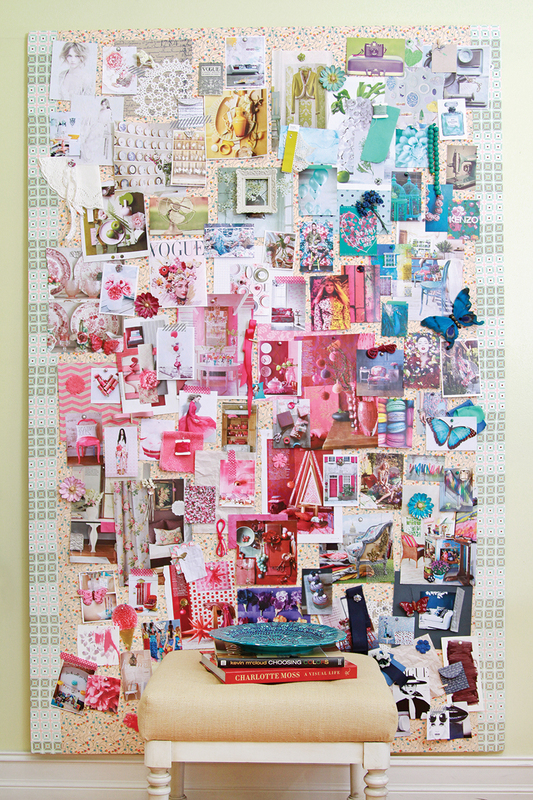 What is your go-to source of inspiration when choosing fabrics for quilting? What are you currently sewing? Giveaway ends Monday 30th at 1PM EST. Good luck everyone! *If you are a a non-reply-er blogger, please leave your email in the comment section so I can contact you in case you win. Thank you Nancy for having me in your blog tour! I had a blast. What a wonderful giveaway, I'm not much of a quilter and haven't mastered FMQ, so quilting with a walking foot is what I do. So, even though that isn't my favorite, it's my only at this time. I use the blogs I read as my source for inspiration for fabrics. I'm always seeing new lines, such as yours, which make me want to sew something up. Right now, I'm not sewing, I'm working on some felt Christmas ornaments. I really enjoy paper piecing-- believe it or not I find it relaxing! LOL! As far as choosing fabrics this is where I suffer. I take days to decide and it is a rough go...lately I have been choosing one "mama" fabric and then pulling colours and patterns from the mama to choose the other fabrics for the quilt... My problem is that I have a lot of stand alone large print fabrics in my stash... I need to beef up my blenders a bit so fabric pulling is easier. Right now I am working on a paper pieced Christmas tree quilt. Looks like a great book! I love to do needle turn applique and find inspiration for choosing fabric on blogs and Pinterest. I'm currently working on several projects, but would love to find time to finish my Mrs. Billings quilt! Hi Great Giveaway ! I'm working on Christmas gift place mats. Nature and its varied creatures and seasons inspire my projects the most ! Just learning FMQing and loving it. Thank You ! Hi! Thanks for the giveaway! I mostly send out my quilts, but am starting to quilt some of them. Trying some updated things with just the walking foot and starting some free motion stuff. My fabric inspiration comes mostly from nature. I experiment a lot more with color now then when I started top. I love picking out fabric! I am working on a low volume quilt with stars and mod trees (crazy mom quilts' tree pattern). Oooh!!! This looks so pretty! I'm already thinking about making a few of these mini blocks to turn into a bigger quilt! I love quilting but sewing on a home sewing machine makes me feel like I can only do straight lines and simple shapes. 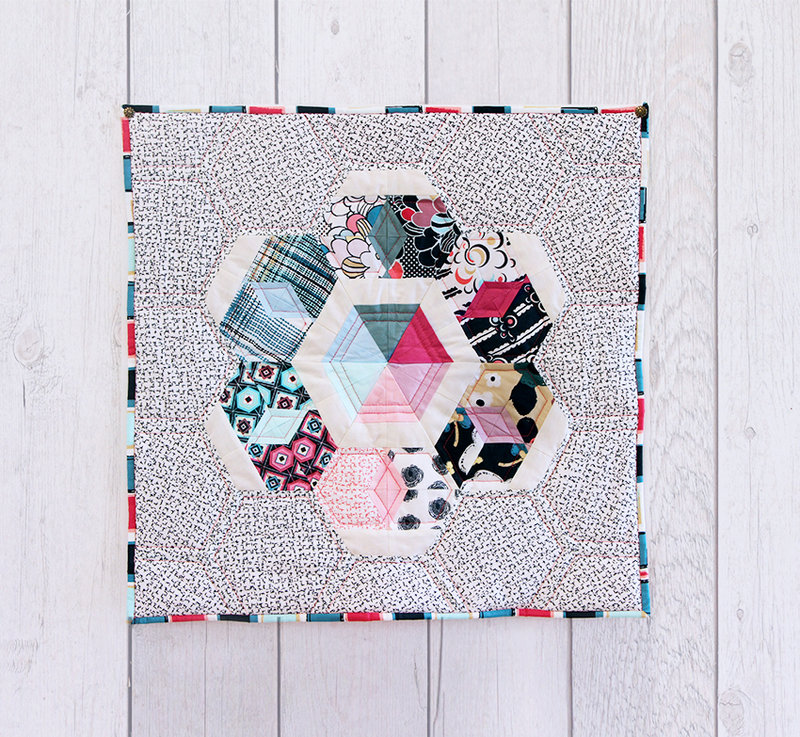 (I like to hexagone quilting example!) I follow a few fabric designers on Instagram and so I get most of my fabric drooly and addiction on there. Right now I'm sewing quilt 2 for two twin boys. They are both getting their own. I used the same fabrics but different layout! It's been fun! My favorite technique has got to be FMQ, even though I'm not good at it. I love looking at everyone else's gorgeous work on blogs and instagram, it can be so inspiring yet so intimidating. For fabrics it's really what I see in my inbox from bloggers and newsletters from shops, if I see a fabric I like I immediately go to Pinterest, or Google, and see what projects people use it in or look at quilt patterns and blocks that I've saved and try to visual that fabric in the quilt or block. I wish I had time to sew, mostly trying to pick out patterns and stick with them, then cutting out the fabric. My newborn just turned 1 month and the 4 year old no longer naps, and my 2 year old HAS to sit on my lap when/if I get the chance to sew, the buttons and knobs are just too much fun to touch while mama sews ;). But I will get back to it eventually I have such a strong urge to make a quilt for my son with his favorite colors, orange and green, and using a picture of a quilt in American Quilter, January 2015, by Doris Brunnette and Trina Kirkvold as my inspiration. My favorite technique right now is paper piecing. I love the accuracy you can get with it. I get my inspiration from Pinterest and Instagram. I love seeing what everyone else is doing with modern fabrics. Right now I'm busy sewing a bunch of pouches, tissue cozies and fabric baskets for a crafts show I'm doing next month. Your quilt looks fantastic! I'm a huge fan of improv, it's my happy place. I mostly do straight line quilting, but I'm trying to branch out more. My FMQ needs a lot of practice but I'm hoping to add that to my quilting arsenal. When it comes to choosing fabrics, it varies. Sometimes something just calls out from my stash and I have to make something. Other times, I have a quilt pattern in mind and I just kind of know the fabric when I see it. I'm currently working on an improv quilt using all solids. It's been sitting waiting to be finished for quite a while, I'm excited to finally get back to it! I love to free motion quilting even though I haven't mastered it. I love modern quilts and get my inspiration from pinterest and a few blogs including yours. I order most of my fabrics from Craftsy.com. I am currently sewing a half sqaure triangle quilt. I am currently making hexis for table toppers for my friends for Christmas. I get lots of inspiration from blogs I follow. I am mostly checking out new fabrics on the web. I'm using my stash and only buying what I need to complete the quilt.